Winter keeps trying to happen and the ice has begun to form on smaller lakes. This weekend though, there were two potentially serious incidents. On Saturday, December 1, 2018, at 9:56 a.m., members of the James Bay Detachments of the Ontario Provincial Police (OPP) responded to a report of someone in distress on the Moose River, near the shore of Moosonee. Three persons were stranded on the ice a short distance from shore. With the assistance of the Moosonee Fire Department and the Weeneebayko Area Health Authority (WAHA) Paramedic Service, all three were brought to shore safely. One person was taken to hospital as a precaution. On Saturday as well in Superior Bay (near Duluth, Minnesota) another rescue took place. 35 people were rescued from an drifting ice floe by a Coast Guard Station Duluth ice rescue team working with the St. Louis Fire Department and the Department of Natural Resources. Their ice floe was adrift approximately 30 feet from shore. The Coast Guard and OPP continually reminds the public to exercise caution near the water. 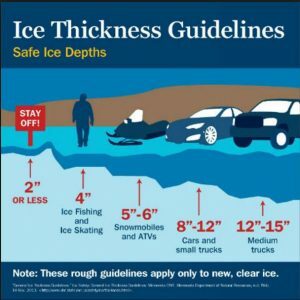 Remember, no ice is “safe ice“. Underlying water currents or air pockets can create thin ice, even in the coldest temperatures. Ice is unpredictable and dangerous. Those planning on being on or near the ice should check conditions, share their plan with somebody onshore, wear the proper attire in case the ice breaks, and bring proper equipment for self-rescue and reporting.